Today, it was warm enough to go outside without a jacket. I know, finally! Let's just ignore for a moment that I was uh, still needing to wear boots and a cashmere cardigan. Anyway, now seems like a pretty good time to start thinking about ways to welcome the new season, and to prepare for all it brings. There are thousands of ways to prepare for Spring, six of which I've listed below as a sort of mini-brainstorm ready for the brighter months ahead. Read on, and let me know your ways/ideas for gearing up for Spring - here's to brighter mornings! Experiment with Beauty - Spring is famous for bringing about changes, and so if you've been thinking about changing your hairstyle, finding a new signature fragrance or switching up your beauty regime, now is the time! Emotional Clean-out - As 'wishy washy' as it sounds, the less weighing you down, the better your experience of the season will be. Let go of anything you feel is holding you back. Personally, I've been jotting down anything that has regularly worked against keeping a smile on my face, ready to determine what needs changing before Spring kicks in. At the very least, it's a fabulous excuse to buy a pretty new notebook, right?! Freshen Up Your Workspace - Before the new season gets underway, the space to focus on first is your home office and/or desk area. Anything that doesn't have you reaching for peonies and celebrating bright mornings can be packed away. Switch those candle fragrances to fresh notes, swap the bulbs for brighter versions and pin up inspirational, pretty prints left, right and centre! I love your suggestions! Spring always brings joy to my heart, especially when I see flowers popping up around me. I hadn't thought of refreshing my work space, but I will definitely be doing that. I always love "Spring cleaning" my wardrobe! So exciting that spring is just around the corner!!! I always enjoy doing the wardrobe changeover because it's a great opportunity for me to check the things I don't wear anymore and put them aside for charity :) It's an activity that always makes me feel light and happy! We have that box bag and it's the besssssst with the gems! AMAZZZZING post babe! Thanks for sharing these tips Gabrielle! I think emotional clean out is the best in this list. This is such a great list Gabrielle! I could do with a nice emotional cleanout :) You've really made me want to get a vase of flowers for my office too! These are such great ideas of things to do for spring girl ! I am definitely looking forward to busting out some spring pieces that have been tucked away and also, I too am trying to pre-plan celebratory things haha. It makes life much easier ! 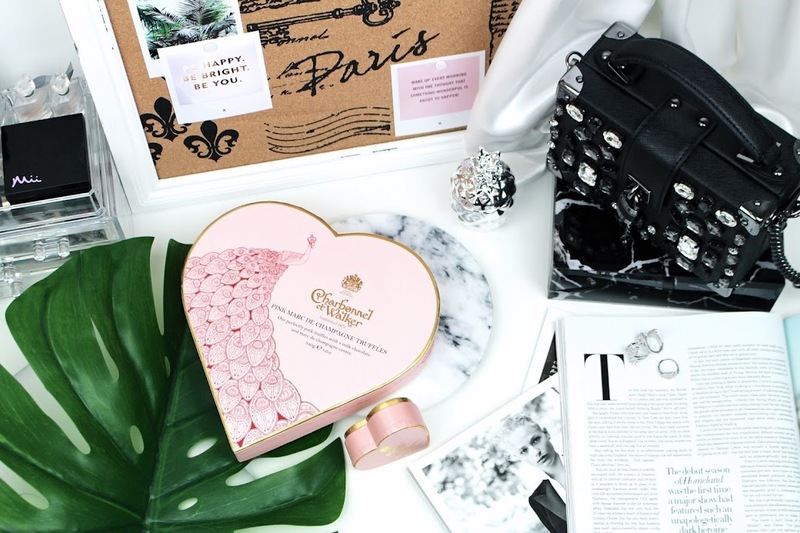 Btw, that box of Charbonnel chocolates looks DIVINE...! I am planning on doing a wardrobe overhaul this weekend. Helps that it is raining cats and dogs over here. I have been rotating my makeup again and yes, also purging some clothes. Getting rid of stuff or rotating products are the best way to get me in the mood for the new season. I cleaned my closet the other day. It took me hours but it felt so good...and it made me start to plan all those cute Spring outfits- so that's another method to start looking forward to Spring. I think that most of us look forward to Spring, but the sudden change of temperature and season can leave us feeling tired so it is good to think of ways to greet the Spring in the most positive way possible. Sometimes we want to do everything at once and that can get overwhelming. So, it is good to plan and organize our way into Spring! Having a notebook always helps me to organize myself better- in almost any activity it can be so helpful! I love your idea of having a positive notebook, a place where you can note down things that make you smile and ways to feel more happy. That's such a fantastic idea! Sometimes little changes can very meaningful...sometimes cleaning our lives emotionally is not as difficult as we imagine...A bit of honesty goes a long way. I should start a notebook too! Clearing our and redecorating our work place is a great way to keep ourselves motivated...and I do agree that a different hairstyle or new beauty routine can be refreshing as well. Changes are good, right? Such great tips! Thank you for sharing! These are great suggestions, girlie! You know, I've always felt as though spring should mark the beginning of the new year because it's a sense of rebirth for nature and we're all so optimistic and happy because of the flowers blooming and warm weather. That said, I love your suggestions for bringing spring to you by adding flowers to your home and experimenting with different beauty looks, something that I actually haven't done in so long! I also love the idea of really meditating on and changing those things that can be holding us back and preventing us from feeling happy and truly living our lives. Thanks for sharing and I hope you're having a great week so far! I'm so ready for spring... I already did a closet/room clean. Now I'm ready to get outside in the sunshine. I'm so excited for spring. A wardrobe clear out is on my list of things to do. It'll be tedious but quite liberating. I love it when the sun starts to make an appearance in Spring! I love all of these little tips. It always feels so nice to start a new season having cleaning things out a bit! An emotional clean-out sounds like such a necessary thing - I definitely have some things I need to let go of. Great ideas and tips, I'll definitely be spring cleaning my wardrobe this weekend! Great tips and I'm starting to do some of them already - I've definitely noticed lighter colours sneaking to the front of my wardrobe and I've been loving getting outside more! Such an amazing post . Spring is my favorite season and these things are so fun to do specially the weardrobe changeover. I'm totally ready for spring or summer ! I can't wait to wear little skirts and dresses. Spring is my fav season, there is moething in the air that makes seem everything so fresh and brand new! And it makes me want to referesh and clean even my living spaces and wardorbe! I'm already experimenting with beauty, something about the Spring makes me want to push my creativity! There are a couple things on this list that I really plan on doing - first, getting some fresh air! Yesterday during my lunch break I went for a little walk, and seeing the first daffodils and crocuses on the side of the pathway made me really enthusiastic about spring. Also, I really, really need a wardrobe change - I only have dark, winter clothes and all I want now is pastels! So true, I think I have to emotional clean up before the Spring coming!! You make me so excited for spring! I really can't wait to enjoy the environment more. Gabrielle, I do all of these and they really do make you feel great. They're so important to do. Great tips! i'm so ready for spring ! Even though it's not spring for me I'm basically doing all of this as well so obviously I'm not going by my own timezone! I've been clearing out my wardrobe, planning things like crazy and re-organising and freshening up all my spaces. YES to a wardrobe change over love - I really need to swap out my chunky knits and coats and move in my Spring wardrobe; the weather lately has got me SO excited for Spring/Summer! Great ways to get ready for Spring! Need to start doing them soon! I really love your ideas here especially about the flowers, and re-vamping Winter fake flowers and painting the petals or stems white, lovely idea! It's so nice to see the sun shining and I hope it lasts, everything looks so much more beautiful in the sunshine! Happy Friday and wishing you a very Happy Weekend!